WHAT DOES IT TAKE TO KEEP YOUR WOOL CARPETS LOOKING GOOD? Cleaning wool carpet the right way. To follow-up on our services about wool, the thought I would look for an expert on cleaning. In the floor covering industry Ruth Travis, is the Director of Wool Safe. The WoolSafe Organisation is a resource for information and advice about carpet and rug care and a range of carpet care services to carpet owners, carpet suppliers and the providers of carpet care products. Ruth you’ve been a part of the carpet industry for a long time, how did you get started? Having a degree in textiles, I’ve always had an interest in fabric of all types. From 1985 to 1988, I managed a Fiberseal office in Chattanooga and started a small cleaning company. Then in 1988, another woman and I started our fabric care service in Chattanooga, Tennessee called Interior Care where we performed fabric cleaning, protection, and inspection and color correction services for clients, interior designers and carpet mills. In 1995 I opened a retail rug store, The Rug Exchange. I sold my share in the business to my partner in 2001 and shifted my focus to training and instructing in cleaning of rugs, carpet, upholstery and carpet inspection to other professional cleaners. During that time I became very involved with the IICRC (a certification organization of approximately 50,000 professional cleaners and restorers) serving on the BOD for more than 10 years. I eventually became the first woman President. After fulfilling my responsibilities as President of the IICRC from 2006 to 2008, I was named the Director of the WoolSafe Organization in North America. In 2010, I became a consultant with ProCare in Nashville, Tennessee overseeing their new rug cleaning operation. In June 2011, I moved to Denver to work with Chase Carpet and Rug Care in a similar capacity. I continue to serve as the Director of WoolSafe. What is “Wool Safe” and how did it start and what is the connection to the wool industry? The WoolSafe® program is actually a threefold program . . . chemical testing, technician training and company verification. Originally established in 1991 by the International Wool Secretariat (the Wool Bureau in North America )- the WoolSafe® Organization launched an approval program for professional carpet cleaning products and technicians in October of 1998. There are now more than 160 cleaning products that have been tested and approved for use on wool and other fine fabrics. The WoolSafe® Fabric Care Specialist Training Course can be found on-line at www.rugladyseminars.com/woolsafena. It provides rug retailers, professional rug cleaners, facility managers, in-house cleaning personnel, design professionals and others with a convenient and cost-effective means for advancing their knowledge of wool-rich carpet, high-value rugs and upholstery. Once a student has completed the course, their company is eligible to apply to become a WoolSafe® Approved Service Provider. The Service Provider’s contact information is listed on the International Registry at www.woolsafe.org/usa, Wools of New Zealand and Housekeeping Channel websites to enable interested parties to find trained and professional cleaners to maintain and clean their fine wool carpet and rugs. What changes are you seeing in the wool industry? As you are well aware, consumers are turning to more hard surface flooring alternatives for living areas, therefore area rugs have climbed to 25% total carpet production market share in the U.S. And that figure doesn’t include the imported Oriental and specialty rugs coming from other countries. If you include these, rugs represent about 30% of flooring. Most of these rugs are made of wool or other natural fibers. In addition there is a new program coming out of New Zealand to bring more affordable wool carpet to the residential consumer. Of course wool carpet has been used for years in luxury hotels and professional offices. What is the best thing a consumer can do to keep their carpets looking better longer? Since 75-80% of soil found in carpet and rugs is dry particle soil, vacuuming with a CRI-SOA (www.carpet-rug.org) approved upright vacuum cleaner at least once a week is the best procedure the consumer can perform to maintain their wool carpet or rugs. What type of cleaning is the best for wool? There are numerous methods of cleaning wool. Choosing the “right” method is based on a number of factors including but not limited to: type of traffic or use, physical condition of the carpet or rug (ie. Antique hand-knotted rug), construction, pattern, style and colorfastness. 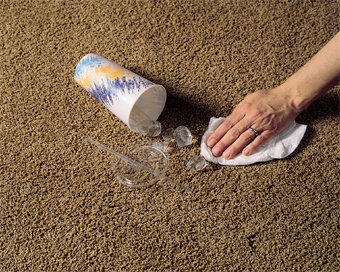 A professional carpet or rug cleaner will be able to analyze these items and determine the proper method. Should the consumer clean their own carpet? I don’t recommend DIY cleaning, especially on wool carpet or rugs. However, as I mentioned earlier, consumers can keep their carpet and rugs cleaner, longer by vacuuming more often especially in high traffic areas or if they have pets. Also, there are consumer spotting products that can be used to help maintain the carpet or rug in between professional cleanings. A list of WoolSafe-approved products can be found on the WoolSafe site @ www.woolsafe.org/usa. A listing of professional wool cleaning specialists can also be found on that site. The IICRC also has a list of professionals @www.certifiedcleaners.org. What should a customer be looking for when purchasing a wool carpet? I recommend going to a reputable carpet or rug dealer or interior designer and discussing the consumer’s specific needs: where the carpet or rug will be used? Do they have pets, kids, messy friends? What’s their lifestyle, etc.? Consumers need to have reasonable expectations when selecting wool carpet. There are many colors, patterns and styles to consider, but because wool is a natural fiber, it may take a little more care to keep it looking good. As long as the consumer understands this, they will be very happy with their purchase. Ruth Travis can be reached at R.L. Seminars, Inc., rugladyseminars.com. We have just come off the excitement of The Campaign for Wool and it’s time for another event. For those of you who missed it, the Campaign for Wool was hosted in Bryant Park on 42nd Street and Sixth Avenue (NYC) and included knitters, spinners, thirty sheep grazing and even replacing the water in the fountain with wool. The Campaign for Wool was initiated in October 2008 by His Royal Highness the Prince of Wales, who had observed that the wool industry was facing enormous and unprecedented challenges. We now head off to the Pruyn House and the The Hudson-Mohawk Weavers’ Guild. Every year the group shares their expertise with the public at its annual Show and Sale. This event is held November 15-18 during the weekend prior to Thanksgiving at the historic Pruyn House in Latham, NY. If you’ve not been to the Pruyn House this is a good time to enjoy this historic landmark. Built in the early 1800’s, the Pruyn House served as a summer home for the family of Casparus and Ann Pruyn. Over a very full weekend, the guild takes over the Pruyn House, with each room devoted to a different classes of weaving. There are separate rooms for scarves, bags, clothing, table linens, gifts and, of course, handwoven rugs. Guild members work all year to create items for the Show and Sale, and they spend long hours that weekend staffing the event. Last year I purchased the most elegant, reversible jacket,complete with bat winged sleeves. These one-of-a-kind items are considered “wearable art” because of their uniqueness and beauty. Maybe it’s a ‘girl thing’ but I found it so magnificent that I wore it over my pajamas for a week! It’s creator, Kim Harrison from Ruxville Farm Fiber Arts in Moseley, Virginia will most likely be on hand again his year top discuss and display her crafts. Hand-weaving is alive and well in the United States and across the world. 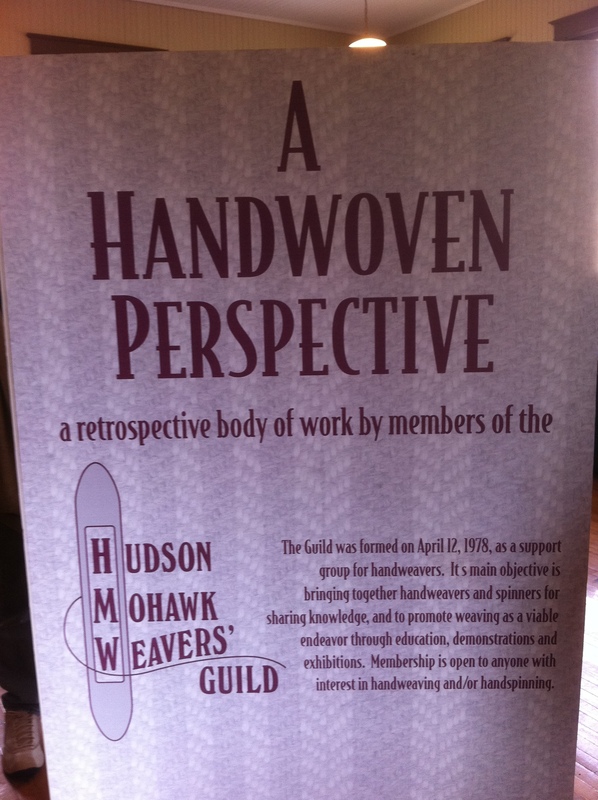 In New York’s Capital Region, the Hudson-Mohawk Weavers’ Guild provides support and encouragement to modern-day weavers. The guild was formed in 1978 and currently has approximately 90 members. The guild’s chief aim is to bring together hand weavers and spinners to sharing knowledge and enthusiasm for the crafts and to promote weaving as a viable craft through education, demonstrations and exhibitions. Membership is open to anyone with interest in hand weaving and/or hand spinning. Guild meetings are held monthly from September through May, with a scheduled educational program each month, plus plenty of time to share recent weaving experiences and finished pieces. Weaving is an art with many facets. There are infinite combinations of different weave structures and color/yarn combinations to explore, making the study of weaving a lifelong undertaking for many modern-day weavers. Among the many variations of weaving is the making of hand-woven rugs. Many weavers enjoy making textiles for the home, including curtains, table linens and rugs. However, rugs present special challenges compared to these other types of projects. They can be made using cotton rags (rag rugs) or virgin yarns of wool or other fibers. There are also cut pile or hand tied rugs, but those are less commonly made by hand weavers in the US. warp threads run vertically and are set up first on the loom. The weft threads are then woven across the warp threads to produce a cloth. Most often American weavers will use a strong warp yarn of cotton or linen, then weave in a weft of rags or thick yarn. Rags can be new fabric or used fabric. Recycled denim jeans are a great weft as they are quite sturdy and are already dyed an attractive color. The ends of each rug can be either fringed or hemmed, according to your preference. Depending on the particular type of rug, the warp and weft threads may show equally, or either the warp or weft may predominate. A wide variety of weave structures can be used to make rugs. Tapestry techniques, in which the weaver manipulates pieces of weft yarn with his or her fingers in a plain weave across the warp threads, can be used to make an attractive rug with limitless design possibilities. Since the weaver places each weft directly among the warp threads, and can change colors at any point across the weft line, there is complete freedom to make any type of design, even something quite pictorial. The warp threads are spaced widely and are completely hidden by the weft as it is packed in with a tapestry beater. The direct manipulation of each weft thread can be quite time-consuming. Other weave structures rely instead on a using the loom to lift particular groups of thread in a particular order with each weft shot to produce a pattern. Krokbragd is one such structure originating in Norway, and it is commonly used today to make rugs with beautiful color effects. Krokbragd produces a weft-faced texture, and the warp yarns are completely hidden by the densely packed weft. This weave produces angular designs with color progressions governed by the choice of weft yarn used in each weft shot. Simple plain weaves and twills can also be used to make rugs, but it is important to ensure that a sturdy warp yarn is used, as the warp will show on the surface of the rug when using these structures. It is thus part of the design as well as being subject to more wear. By setting the warp threads very closely together, it is also possible to make a warp-faced rug, in which the weft threads are mostly hidden. This type of rug lends itself to lovely stripes of color running in the warp direction. Depending on the weave structure, the two sides of a rug may be similar or may show entirely different patterns or colors on each face. Modern day weavers can take advantage of complex looms with many pattern shafts; the most complex looms often require a computer interface to control the order in which the shafts are used during weaving. Similarly, while weavers used to design patterns on graph paper, many now take advantage of specialized computer programs to design the patterns they will use for each piece. Although many weavers integrate these modern advances into their craft, the basic wooden loom design is almost timeless, and a well-built loom can last for many decades. Because rugs take so much abuse (they are literally walked upon everyday), they must be very sturdy. Thus a loom designed to make rugs must heavily built. They are typically made out of thicker wood than a regular loom. The beater, which compresses in the weft, is weighted in order to provide greater force to pack the weft in tightly with each beat. Special gears permit the warp threads to be maintained at a very high tension during the weaving process. A regular floor loom is likely suitable for making a rug or two, but any weaver serious about making rugs will eventually get a loom meant for rug weaving. Care of hand-woven rugs is relatively simple. Wool naturally repels dirt, so vacuuming and spot cleaning is all that is typically needed. If the rug is very soiled, it can be carefully hand washed and sometimes even machine washed in cold water. The various breeds of sheep produce very different types of wool. While a fine wool like merino is very soft and often used for clothing, this fine fiber will easily felt when washed if agitated or upon quick temperature changes. But the wool used for most rugs is coarser and resistant to felting, so it can be washed with less worry of felting damage. Most cotton or rag rugs can be machine washed. With good care, a hand-woven rug can provide many years of service in your home. Don’t forget to add this event to your calendar, Nov. 15-18th at the Pruyn House in Colonie, New York Fabulous Floors Magazine will be covering the event and giving out copies of the Wool Book. You can download the wool mobile application at the Google Store. Lisbeth Calandrino is the associate publisher and social media manager for Fabulous Floors Magazine. She can be reached at Lcalandrino@nycap.rr.com. The other day as I was leaving the house I started thinking about the new color palette for 2013. Interestingly the phone rang and it was Sherwin Williams! Who would be better to talk to about color? Of course my first question was, what are the hot colors for 2013? Here is their great article on what we will be seeing in 2013. 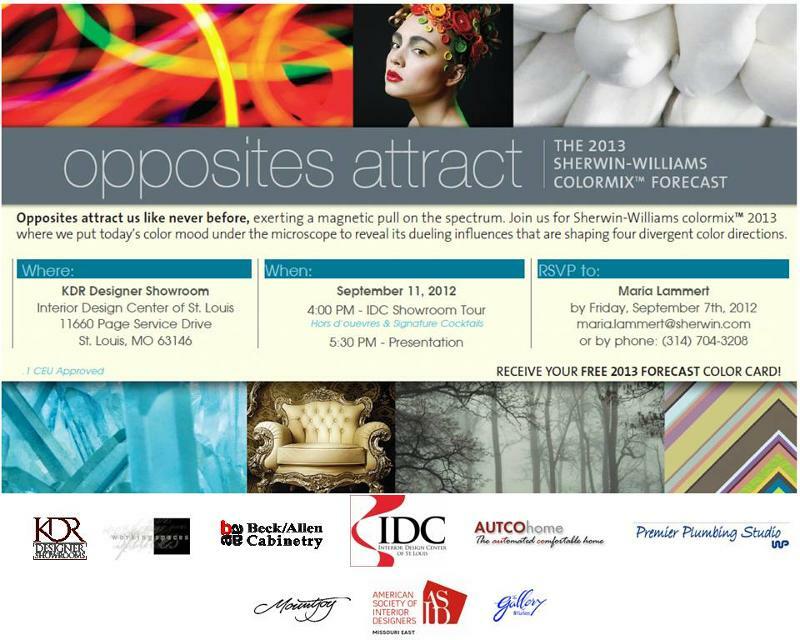 I have added several links so you can get more information on color trends and Sherwin-Williams. Sherwin-Williams embraces the dueling influences competing for attention in today’s hyperkinetic, vividly saturated world with its thoughtfully selected 2013 color forecast. From exploring the dichotomies of simple versus complex, to mystery versus certainty, and to light versus dark, consumers will find inspiration in next year’s color palettes. The 40 colors selected by Sherwin-Williams color experts are grouped into four palettes: Midnight Mystery, Honed Vitality, Vintage Moxie and High-Voltage. Our dark side beckons; we’re irresistibly drawn to its murky depths and shadows. The colors of Midnight Mystery are moody, the vibe is masculine and the aesthetic is both Victorian and futuristic. Earthy Plum Brown, absinthian Bottle Green, the metal gray of Outer-space and Rustic Red evoking the hounds tooth cloak of Sherlock Holmes — these are the intriguing shades of the Midnight Mystery palette. The Honed Vitality palette reflects the interplay of time and nature, taking inspiration from the layered hues of mineral deposits, sea-buffeted stones and the weathered shutters of a rustic farmhouse. The colors are chalky greys and blues, and earthy cider-colored browns. Finishes are matte with an organic, textured feel. Representing mid-century demure with a new, modern edge, Vintage Moxie is a pretty palette in which the retro glamour of pearls, floral and classic feminine silhouettes is tempered by funky accents and attitude. While the Honed Vitality palette is more subdued, these classic colors are a bit more vibrant, yet still remain true to their roots. The electricity of Vegas neon inspires this palette, which plugs in to a digital stream of electric limes, phosphorescent yellows and feverish reds. It’s consumerism as self-expression, giving the bold and the not-so-bold equal permission to be nonconformists. The High-Voltage palette leaves nothing to the imagination, in stark contrast to the colors of Midnight Mystery. Sherwin-Williams online Color Visualizer helps consumers interact and experiment with the 2013 color forecast, along with more than 1,500 Sherwin-Williams colors. By uploading your own interior or exterior images, or choosing one from the site, you can “paint” your walls before ever picking up a paint brush. Find the Color Visualizer at https://www.sherwin-williams.com/visualizer/. In addition to the Color Visualizer, Sherwin-Williams offers a range of color selection tools to help consumers find inspiration for their next project, including the free color-matching mobile application ColorSnap® and Chip It!, an interactive tool that turns your favorite images into paint palettes. Find Sherwin-Williams color resources at http://www.sherwin-williams.com/homeowners/color/color-selection-tools/. As the nation’s largest specialty retailer of paint and painting supplies, Sherwin-Williams is dedicated to supporting do-it-yourselfers with exceptional products, resources to make confident color selections and expert, personalized service that’s focused on unique project needs. Sherwin-Williams is committed to environmental responsibility in both manufacturing processes and finished products, and in 2011 earned the EPA Presidential Green Chemistry Challenge Award. Sherwin-Williams products can only be found at its more than 3,400 neighborhood stores across North America. For more information, visit sherwin-williams.com or join the color conversation at facebook.com/sherwinwilliamsforyourhome. As the nation’s largest specialty retailer of paint and painting supplies, Sherwin-Williams is dedicated to supporting do-it-yourselfers with exceptional products, resources to make confident color selections and expert, personalized service that’s focused on unique project needs. Sherwin-Williams is committed to environmental responsibility in both manufacturing processes and finished products, and in 2011 earned the EPA Presidential Green Chemistry Challenge Award. Sherwin-Williams products can only be found at its more than 3,400 neighborhood stores across North America. Lisbeth Calandrino is the associate publisher and Social Media Manager for Fabulous Floors Magazine. To book a ‘Fabulous Floors Night’ for your business, she can be reached at Lcalandrino@nycap.rr.com. For more information, visit sherwin-williams.com.